What did the SDA Pioneers believe? Being a Pastor in the remnant movement, it is my duty to be a faithful watchman on the wall. I must alert all those remnant Christians out there that are being led into apostasy by following after the corrupted teachings of mankind. So I pray this sermon is accepted as a warning to those who may be on the fence on this topic. There is a booklet moving in certain circles that is titled, “What Did the Pioneers Believe?” that needs the Light of Truth placed upon it. It is directly focused on bringing ex-SDA’s, and new brethren in the remnant movement back into apostasy with Rome. With the Holy Spirit’s assistance, I will share with you what the Word of our God says about the message I found in this strange booklet. I will not go line by line through this booklet at this time because of what I found early on while looking into this. Perhaps soon, I will do an in depth study line by line if the need arises. But for now, I will only touch on areas that will provide the remnant people the necessary ammunition to combat this assault on God’s Truth. Hopefully the truths I share here will give those that are thinking of joining this movement enough evidence to see that it is clearly not of God. Not only are they allowing someone they know to be preaching heresy to speak for them. They actually admit he “left the movement” 1 year after doing the study they placed in their strange booklet. Yes, Uriah Smith later recanted the strange doctrine of Jesus being a created being, but, J.N. Loughborough never did as far as I can see. Yet, he is also allowed to have his say on page 35. What is obvious here is a mixing of truth with error so as to preach a new doctrine as if it is new light. Problem is, new light never contradicts old light. For it is plainly written in Isaiah 8:20, "To the law and to the testimony: if they speak not according to this word, it is because there is no light in them." What they are doing in this doctrinal brochure is called confusion, which is not of our God as many of us are very aware. In fact, that is the main fruit of Roman Catholicism, or Babylon as prophecy calls it today. The word Babylon actually means, “confusion by mixing” in the Old Testament, and just plain confusion in the New Testament. This is how Satan has always worked through Roman Catholicism. He mixes just enough truth with error to make it believable to unsuspecting souls. 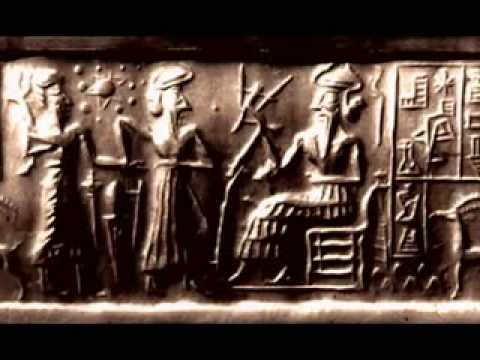 Babylon = "confusion (by mixing)"
1) a very large and famous city, the residence of the Babylonian kings, situated on both banks of the Euphrates. Cyrus had formerly captured it, but Darius Hystaspis threw down its gates and walls, and Xerxes destroyed the temple of Belis. At length the city was reduced to almost solitude, the population having been drawn off by the neighbouring Seleucia, built on the Tigris by Seleucus Nicanor. The authors of this doctrinal brochure allow men they admit advocate heresy to preach unto the bride of Christ as if they are trusted men of God. What does the Word of our God in Heaven say about such an act as this? 1 Corinthians 10:21, "Ye cannot drink the cup of the Lord, and the cup of devils: ye cannot be partakers of the Lord's table, and of the table of devils." For those that compiled this spurious pamphlet to suggest it’s ok to use statements from people documented to not only be heretics, but outside the original faith, is no different than Christians listening to non-believing politicians that quote from the Bible. After all, is this not how Rome was able to merge Paganism with Christianity long ago? On page one of this strange booklet they quote Ellen White where she says, “God has given me light regarding our periodicals. What is it? He has said that the dead are to speak. How? Their works shall follow them. We are to repeat the words of the pioneers in our work, who knew what it cost to search for the truth as for hidden treasure, and who labored to lay the foundation of our work.” That statement was found in “Counsels to writers and editors” on page 28. What I would like to highlight is the fact that Sister White said, “We are to repeat the words of the pioneers in our work, who knew what it cost to search for the truth as for hidden treasure, and who labored to lay the foundation of our work.” The authors of this booklet on the other hand admit in writing within their table of contents that J.M. Stephenson, as well as J.N. Loughborough are not Pioneers that have adhered to “our work” at all. 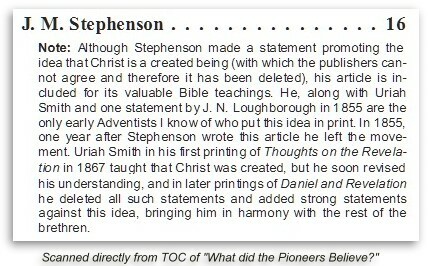 In fact they admit Stephenson left the work within a year after writing the article they placed in their doctrinal brochure. Most are unaware of this, but this is an age old tactic of Roman Catholic prelates. They claim an act is wrong to do in one sentence, and then confirm it is wrong to do in another, while in fact doing the very thing they say is wrong to do in the first place. Do their methods confuse you? Of course they do. That is the main fruit of Babylon. That’s how it works. They dazzle with crafitness. When Sister White was talking about the pioneers, that do “our work,” she was not in any way, shape, or form stating it was ok to repeat the words of those that do not do “our work.” They also quoted sister White from the same book on page 29 where she said “the truths that have made us as a people what we are, leading us on step by step.” But how can J.M. Stephenson or J.N. Loughborough be leading anyone step by step? The authors of this doctrinal brochure admitted in writing these men sidestep the truth when declaring Jesus was a created being. How can they be leading anyone “step by step” when their steps lead off the path of Christ’s written and sacred Truth? For the authors of this strange booklet to say Ellen White agrees with proven heretical pioneers that left the movement are trustworthy, is nothing short of a bold faced lie built heavily upon Babylonian confusion. And to claim she agrees with them by using her words as a blanket statement is seen by those with eyes that see to be deliberately deceptive as well. I make no apologies for my boldness here, because I have been taught that as a watchman on the wall I must be very blunt at times. This is a very dangerous booklet to say the least and I will not beat around any bushes because I cherish the desk I am called to speak from. As you’re about to see, it quite brazenly ignores many clear SOP statements as well as enlightening Scriptures in order to preach this strange doctrine of theirs. All throughout this booklet you will find out of context statements from Ellen White as well as some pioneers claiming the Holy Spirit is nothing more than a thought process of the Father or the Son, and Jesus is not to be considered a God. To further push this deception, you will not see one statement from Spirit of Prophecy in this doctrinal brochure wherein Sister White does in fact declare there are three separate persons in the Godhead. For example, if you enter "three living persons" into the Spirit of Prophecy CD, or do so on the EGW website, you will find five statements made by Sister White. The first of which is the following. Sister White also stated the following which is not shared in their doctrinal brochure either. Now, keep in mind, the authors of this strange booklet do in fact declare Sister White to be a prophet. And as is common knowledge, prophets are inspired. However, pioneers are not inspired! On page eight of their doctrinal brochure they actually go so far as to say “Every statement from the Bible and the SOP on this subject must be given a chance to speak, and we must go with the weight of evidence.” Yet nowhere in their strange booklet do you see the previous quotes I just shared. They are strangely and utterly missing. The reason they refuse to list such comments from Ellen White is because to share them would be to expose all their other quotes as completely out of context. Yes, they claim SOP and the Word of God are inspired; but as you read their doctrinal brochure they put forth the assumption repeatedly that the pioneers should be trusted over and above the Word of God. What does our Lord say will happen when we ignore His written Word on such easy to research matters as these. 2 Thessalonians 2:10-12, "And with all deceivableness of unrighteousness in them that perish; because they received not the love of the truth, that they might be saved. And for this cause God shall send them strong delusion, that they should believe a lie: That they all might be damned who believed not the truth, but had pleasure in unrighteousness." 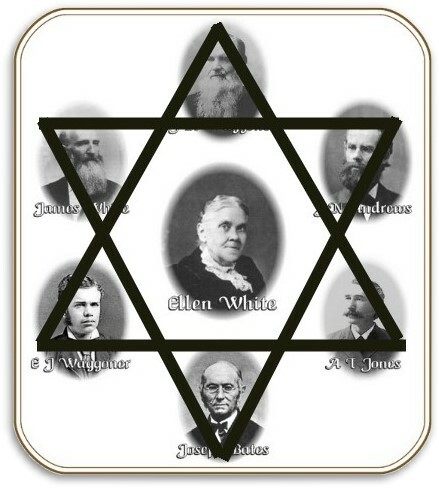 "You mentioned Ellen White, but she isn't to be used to prove Bible Truth.” –K.C. After stating SOP cannot be used to prove Bible truth, and then saying a Bible verse should be removed, how can they say on page 8 of their strange booklet that, “Every statement from the Bible and the SOP on this subject must be given a chance to speak, and we must go with the weight of evidence.” How does one give SOP or Scripture a chance to speak when you ignore SOP, and rip out Bible verses that go against their strange doctrine? In other words, they really don’t want to discuss the truth, they just want you to follow their lead. Matthew 28:19, "Go ye therefore, and teach all nations, baptizing them in the name of the Father, and of the Son, and of the Holy Ghost:"
Jeremiah 7:4, "Trust ye not in lying words, saying, The temple of the LORD, The temple of the LORD, The temple of the LORD, are these." Bottom line is this: If the Holy Spirit is just a though process like they say, then why did the Dove appear when Jesus was baptized while the Father’s voice came from the Heavens? What was demonstrated clearly was God the Father was in Heaven speaking. God the Son was on earth being baptized. God the Holy Spirit was flying in the air above Jesus. Each separate person of the Godhead in three separate places before the eyes of many on that wonderful day. Could it be that happened in that specific way so as to combat the error that’s being preached today? We will know when we get home. Both the Trinitarian preachers of Rome, and the authors of this spurious doctrine cannot explain that blunt exhibition of God’s glory on that day! They can only ignore or delete it from their Bibles. So, after all is said and done, do you see a pattern here? I know I do. When I first came across this heresy some time ago about the Holy Spirit not being part of the Godhead, or Jesus not being a God, I saw those preaching it ignoring Ellen White in specific areas as well as removing Bible verses in other areas. It wasn’t until I saw their statements about J.M. Stephenson in the table of contents of their strange booklet that I made the connection which lead to this page! So I thank whoever it was that sent me that booklet some time ago! The adding of Stephenson’s words, as well as the deleting of SOP and Scripture that went against their creed, proves their theology is based on whatever their creed has penned. If they find something that goes against their theology, they simply ignore or delete it. The fact they use Stephenson and Loughborough in their doctrinal brochure in bits and pieces, or use the Spirit of Prophecy in bits and pieces, or rip out Bible verses that go against what they teach proves this is in fact their agenda. Their creed has become their god. That’s what this strange booklet is doing. They remove SOP in this strange booklet, and they declare Bible verses worthy of deletion all for the benefit of keeping their strange creed intact just as Rome has done for almost 2000 years! That being said, what is more trustworthy? The Word of God with all its verses intact, the Spirit of prophecy with all its statements intact, or this strange booklet put out by those that purposely change the Word of God to follow a manmade creed. Of such as these, our God and Saviour Jesus Christ said in Matthew 15:9, "But in vain they do worship me, teaching for doctrines the commandments of men." I am sure, some of you reading have the question to ask. Why do they teach this strange theology? Why are they saying Jesus isn’t a God and the Holy Spirit doesn’t exist? It has to do with a prophetic event that is about to happen worldwide. It also has to do with a prophetic event that is happening right now. The event to happen is of course the arrival of Antichrist on earth seeking global worship. The event happening right now is the shaking wherein God is allowing these strange doctrines to flourish so as to see who will be faithful to Him and His written Word. Those that refuse to rip out Bible verses to back a creed or disregard statements from His prophets will be used by Him to glorify Him like no other in the history of the Christian church. As this shaking continues to occur, all people will be tested to see if they will follow the Lord’s Truth as it is found unmolested in the Holy Scriptures, or the lies of those that delete and ignore His Scriptures. As always, the choice is still ours as individuals. It is the prayer of this ministry that you make the right choice. For those involved in this strange booklet that purposely ignores the written Word of God for the contrived commandments of men, all I can do at this point is echo the Words of my dear Saviour, when He said in Matthew 15:7-9, "Ye hypocrites, well did Esaias prophesy of you, saying, This people draweth nigh unto me with their mouth, and honoureth me with their lips; but their heart is far from me. But in vain they do worship me, teaching for doctrines the commandments of men." "God has not passed His people by and chosen one solitary man here and another there as the only ones worthy to be entrusted with His truth. He does not give one man new light contrary to the established faith of the body. In every reform men have arisen making this claim. . . . Here's something you may find interesting about the cover of the booklet. 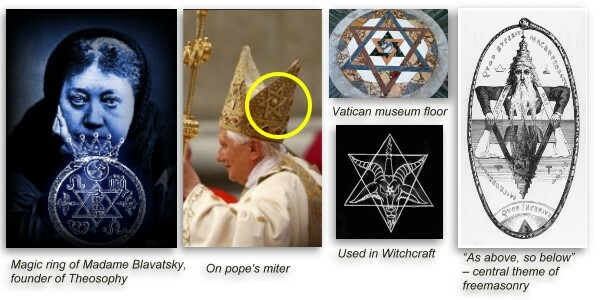 For those of us that know about symbolism and how it's use by Rome to acknowledge loyalty in plain sight, while still being hidden from normal view. One might wonder as to why the graphic on the cover was laid out in such a way. Some may see this as a star of David, while others can see yet another more sinister symbol used in the occult as well as Hollywood often. Especially when there is a circle around it, as this booklet alludes to with the round pictures as well as the rounded edges on the border of the booklet. It also depicts the 2 triangles of the Mason as well as 6 smaller triangles around it. Below are a few examples of how the wicked use this symbol for eons. I also found some ancient Egyptian images with the symbol displayed proudly, as well as some other strange appearances. But I imagine the small list below will be sufficient to get my point across. And no, I am not saying the authors of this strange booklet did this intentionally. It just comes off as a bit odd that they would lay out the cover this way. ONE MORE THING: Notice the "ball" in the middle of the Pope's symbol on his miter. It's the same "ball" that all the ancient Egyptians have in their symbols. It symbolizes their god Baal. Now, notice where they have Ellen White in their cover. Not only is she in the middle, like Baal, they have her in a round shape to boot. Worse yet, her head appears to be positioned to be the "ball" the Pagans and others use to represent Baal. In more modern versions of this symbol, the ball in the middle is an eyeball! And some, like this strange booklet, have the ball inside an oblong circle. Does the Bible say Jesus is a God? Does the Bible say the Holy Spirit is a God?